As global power relations increasingly favour international capital, it becomes crucial for labour and employment lawyers to center their field in a supranational context. As long as wages, social security, and taxes remain national matters, states compete at this level in order to attract foreign investment. This does not bode well for employees or the self-employed. Most ameliorative measures come in the form of unenforceable ‘soft law’ guidelines and recommendations. • the need for an equitable social safety net. In the course of the discussion the authors examine cases from many countries, including not only EU Member States (both West and East) and the U.S., but also Japan, Chile, South Africa, and Indonesia. 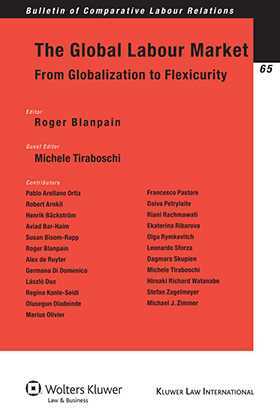 With a focus on the nexus of multinational enterprises and international standards, the book provides both a sharp image of where labour law stands in today’s world—revealing serious social problems in a clearer light than is usually encountered—and a very valuable guide to directions to pursue and potential solutions, offered by some of the most engaged and committed minds in the field. It is an indispensable resource for legal workers in this ‘eye of the storm’ of globalization. Notes on Contributors. Introductory Remarks: Commemorating Marco Biagi; M. Tiraboschi. I. Globalization. 1. The End of Labour Law? R. Blanpain. 2. The End of Labour Law in the Global Workplace Context? A South and Southern African Response; M. Olivier. 3. Global Capitalism and Rise of Non-Standard Employment: Challenges to Industrial Relations Practice; O.O. Oladeinde. 4. Decent Work with a Living Wage; M.J. Zimmer. 5. Joblessness as a Major Challenge for Public Employment Services: Country Reports from Germany, Italy and Finland; R. Arnkil, G. Di Domenico, R. Konle-Seidl. 6. The Role of Regional Organisations in the Protection of Migrant Workers’ Rights; L. Dux. 7. Multinationals and Unionism in Indonesia: Case Studies in Two Multinationals in Indonesia; R. Rachwati, A. de Ruyter. II. Human Resources Management. 8. Globalization and Human Resource Management: A Quantitative Analysis with British Establishment-Level Data; S. Zagelmeyer. 9. Practices of Human Resource Management and Perceived Organisational Growth; A. Bar-Haim. 10. Trends and Perspectives on the Human Resource Function in Europe Emerging from the 2nd Pan-European HR Barometer; L. Sforza. 11. Outsourcing of Labour and Promotion of Human Capital: Two Irreconcilable Models? Reflections on the Italian Case; M. Tiraboschi. III. Flexicurity. 12. Beyond Flexicurity in Sweden? H. Bäckström. 13. Employment and Education Policy for Young People in the EU: What Can New Member States Learn from Old Member States? F. Pastore. 14. Politics of Labour Market Deregulation in Italy and Japan since the 1990s; H.R. Watanabe. 15. Prospects for the Regulation of Temporary Agency Work at EU Level; O. Rymkevitch. IV. Equal Treatment. 16. Globalisation, Equality and Non-Discrimination: An Interdisciplinary Perspective from the U.S. on Diversity Programming; S. Bisom-Rapp. V. Involvement of Employees. 17. The Workforce Involvement in the Labour Market in Bulgaria: Which is the Way after Accession to the EU? E. Ribarova. 18. The Right of Civil Servants to Collective Bargaining: The Case of Lithuania; D. Petrylaite. 19. The Influence of European Union Law on Employees’ Involvement in Poland; D. Skupien . VI. Social Security. 20. The Private Pensions System: Critique Study Based on the Chilean Case; P. Arellano Ortiz.